BlendToTheEnd.com has partnered with Blendtec to provide free shipping for anyone who purchases a blender. Follow the simple instructions below to activate the Blendtec free shipping offer! 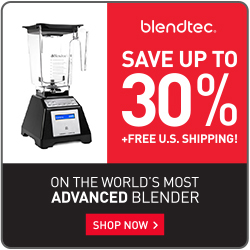 Receive free shipping with any Blendtec blender purchase when you use any BlendToTheEnd.com link. Similar to Vitamix, Blendtec provides free shipping to all customers when you purchase a machine, jar, or accessory. Blendtec makes the free shipping very simple as with Vitamix you need a valid promotion code. If you have any issues applying the free shipping option, please contact us and we will help you out! Just follow these simple instructions to receive free shipping (savings of $25) from Blendtec.com. Visit Blendtec.com using any of the Blendtec links found on our website. Add any blender, jar, or accessory from the Blendtec website. Provide the necessary shipping and billing information. Select the Ground Shipping – $0.00 option from the shipping selection list. Make sure the option selected shows “$0.00”. See the screenshot below if you have any questions. Below is a screenshot of where you select the free shipping option when you purchasing a Blendtec blender. In order to get the free shipping, select the option that shows “Ground – $0.00”. If you have any issues with free shipping, contact us and we will help you out! We’ve partnered with Blendtec to provide you a great deal on Blendtec blenders, jars, and accessories. We are confident in their product and want to provide you the best deal on these amazing machines. Think of this free shipping option as a Blendtec promo code or a Blendtec coupon code. Simply click one of the Blendtec Promotion Code links and the free shipping promo will be applied to your order. This offer is only available to exclusive Blendtec partners. Combine the Free Shipping deal with reconditioned Blendtec blenders and you can save up to $150.